Are You a Reflection of God’s Glory? After dinner Gwen and I challenged Bill and Lisa to a paddleboat race across the lake. “Oh, we’ll cream you guys,” Bill boasted as he and his paddling partner accepted the challenge. He puffed up, knowing that victory was eminent. He was pumped. Gwen and I paddled back to home base, but Bill and Lisa stayed in the middle of the lake as the sun began to sink and streak the evening sky with the handiwork of God. Orange, magenta and red filled the heavenly expanse. Geese conversed. Crickets chirped. Cicadas sang. Deep-throated frogs gave bass notes to natures melody. The moon rose and reflected its face in the water as the mass of summer musicians celebrated season. And right smack dab in the middle of the lake sat two of God’s children awe struck. Captivated. And you know what? I was captivated by watching their response to God’s glory. Isn’t that the way of glory? As we see others living and moving and having their being in Jesus, we want it too. As we sense their sacred in-loveness, we long for the same passionate intimacy with God in our own lives. Don’t be surprised if your moments of sudden glory cause others to tug on your shirtsleeve with hungry eyes and want to know more. Tell them! Oh how I pray that you will tell them! Tell them of the moments of sudden glory that brim in a woman’s heart that lives and moves and has her being in Christ. Tell them of glory moments strewn about by God’s willing hand for eyes to see, ears to hear, hearts to embrace. What an amazing truth: God uses me and you to open hungry eyes to recognize His presence all around – to glorify Him – to make His presence known. Do you long for something more in your relationship with God? Do you have a “glory ache” - a hunger to experience God’s presence on a daily basis? The good new is that God wants that even more than you do. Right smack dab in the spin of the laundry and the sizzle of the bacon - as you live and move and have your being in Him. This summer, take some time to “be still and know”—to hear His still small voice - to dust for His fingerprints on the pages of your everyday life. 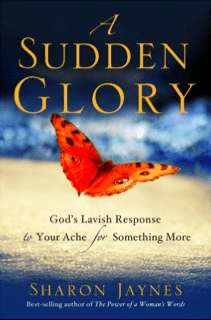 My book, A Sudden Glory: God’s Lavish Response to Your Ache for Something More will show you how. It also includes a study guide and free online Bible study videos. And while you’re on my website, check out the Praying Wives app for smart devices.